Corneille’s tragedy Les Horaces concerns a long and bitter feud between two noble Roman families. This violent story is brought vividly to life by Mercadante’s 1846 opera. Corneille’s tragedy Les Horaces concerns a long and bitter feud between two noble Roman families. This violent story is brought vividly to life by Mercadante’s 1846 opera. 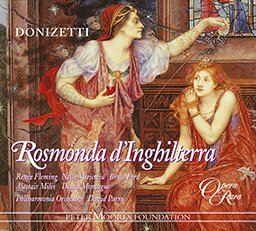 The complex and demanding vocal writing is reminiscent at times of Verdi, the only rival Mercadante faced at this point of his career. 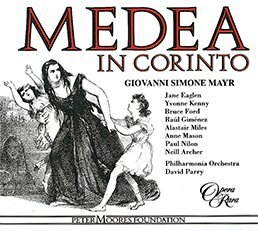 The finale, in which Nelly Miricioiu’s impassioned Camilla curses Rome, ranks among the finest scenes in 19th century opera. Booklet includes full libretto with English translation. 02 Orazi e Curiazi: Act I scena I: Aria: Qual prece o voto, formar portremo? – scena II: Ebben? 04 Orazi e Curiazi: Act I scena III: Duet: Camilla? ? 05 Orazi e Curiazi: Act I scena III: Duet: Talor solingo e tacito – scena IV: Abbracciami ? 07 Orazi e Curiazi: Act I scena V: Aria: Ora fatal! ? De’ padri – scena VI: Orazio? 12 Orazi e Curiazi: Act I scena IX: Addio! 22 Orazi e Curiazi: Act II scena VI: Arde gia l’atroce guerra! ? 24 Orazi e Curiazi: Act III scena I: Aria: Ahi! Come a lei mostrarmi – scena II: Son io ? ravvisami ? – scena III: Che fai, Curiazio? 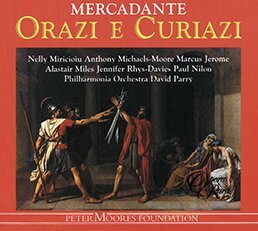 26 Orazi e Curiazi: Act III scena IV: Aria: Sull’alto delle mura ognun de’ prodi – scena V: Oh Roma! 27 Orazi e Curiazi: Act III scena V: Oh! Se morendo , s’ei prolungato – scena VI: Che avvenne? 29 Orazi e Curiazi: Act III scena VI: Salve, guerrier magnanimo – Final scena: No: t’arresta ? 32 Orazi e Curiazi: Act III Final scena: Sento ? l’estremo ? anelito! ? The action takes place in Ancient Rome, in the 7th Century BC. At the Temple of Janus, women are offering sacrifices for Rome’s victory over Alba. Camilla cannot pray, for victory will mean the death of her betrothed, the Alban Curiazio. Senators and citizens hurry in announcing that the battle is over – three warriors of Alba are to be chosen by lot to meet three Romans on the battlefield, and victory or defeat will rest in their hands alone. Curiazio enters bringing the news that the result of the combat will be that Rome and Alba shall live in peace and that now, with her father’s blessing, their marriage can take place. In a vestibule of the Orazi household, the young Orazio prays that he will be chosen to represent his country on the battlefield. The senators arrive to tell him that he and his two brothers have been chosen to fight for Rome. In the Temple of Venus, the wedding ceremony has begun. As Camilla and Curiazio swear the marriage oath, Orazio bursts in to stop the ceremony. The Alban warriors have been chosen – Curiazio and his brothers. Camilla tries to prevent Curiazio from leaving, begging him to kill her first. She knows the wedding is now a dream and turns on the assembly, ‘You commit them to kill each other in competition, and you condemn me to eternal weeping .. the gods are liars’. Orazio bids her to remember her upbringing, her homeland, her gods and tells her she is not a true Roman. Curiazio realises that whatever the outcome, victory or death, Camilla is lost to him forever. Orazio and his brothers kneel at the threshold of their home, asking the blessing of their gods. 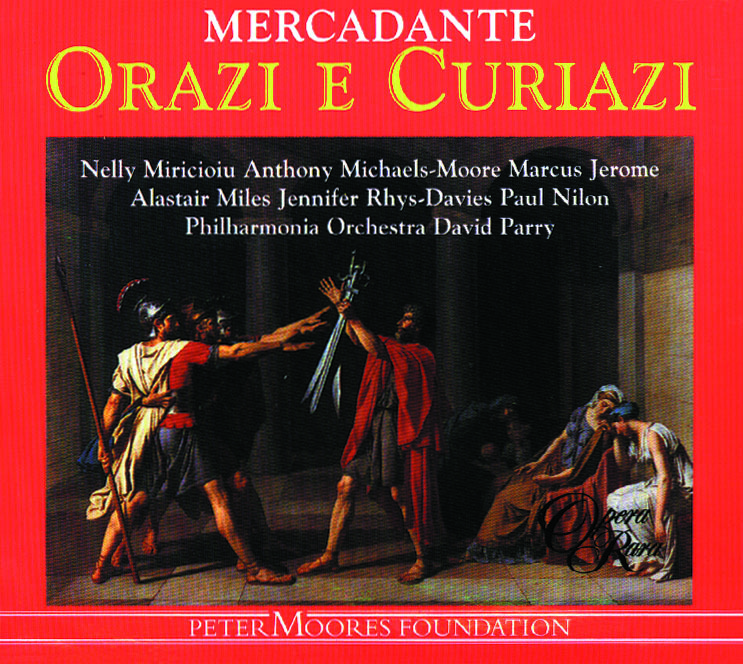 Orazio is horrified when Curiazio enters, and tells him it is not fitting. Curiazio reminds him of their old affection, but Orazio calls him an enemy of Rome. The past is forgotten, he is obliged to kill or be killed by his former friend. Curiazio asks him to remember earlier battles when they fought side by side and Orazio saved his life. He sees that Orazio is weeping and thanks the gods that the Romans do have hearts. They make their farewells as the people call them to the battlefield. Outside the gates of Rome, the Roman and Alban armies take up position. The leaders make their way forward accompanied by the three Orazi and the three Albans brothers. The High Priest steps forward and calls for the contest to be stopped – the omens are not propitious. He tells them to accompany him to the Aventine cavern where the voices of heaven will speak through the oracle. Camilla waits alone outside the shrine. She begs Apollo’s mercy, and asks the gods to prevent the battle, ‘do not force me to curse my lover or my brothers’. The priests and warriors arrive followed by Sabina and the free-born citizens of Rome. A subterranean rumbling is heard. The doors of the shrine are thrown open and the voice of the oracle is heard. ‘You fight: so it is written’. The doors close and Camilla falls in a faint. The warriors return to the battlefield. Camilla, half out of her mind, curses Apollo and the evils of war. Dawn is breaking outside the wall of Rome. Curiazio dreads the coming contest, and the insuperable barrier that has been raised between him and Camilla. If he wins, she will hate him for killing her brothers .. if he loses – death. Camilla enters with Sabina, and begs Curiazio to flee with her, and if he will not, then to kill her. As he wavers, men at arms arrive to ask why he has not taken his place on the field. Curiazio takes his leave of Camilla and tells her that heaven, hell or love will not make a coward of him. ‘Either conquered or conqueror, I am yours no longer’. Orazio the older remains inside his home. He alone has dared not venture to the walls to watch the battle, fearing not for his sons, but for his fatherland. Grief-stricken relatives rush in to tell him that Rome is beaten – two sons are dead and Orazio has turned tail and fled. ‘A son of mine .. a coward’, now only death at his own hands can avenge his shame. Suddenly joyful shouts are heard: ‘Rome .. victory!’ Senators enter to tell him that Orazio has won; by pretending to flee he took the Albans by surprise, and slew them. He weeps, telling the senators they are not tears of shame, but of pride. They leave for the Capena Gate to see the young Orazio crowned victor. Victory trumpets sound as Orazio enters and the crowd hail him ‘magnificent warrior, the memory of your valour will be eternal’. He replies that not he, but Rome is the victor. Camilla enters, dishevelled, and out of her mind with grief. She throws herself before her brother. ‘There is yet one more victim to be struck down before your triumph is complete’. Suddenly she sees the body of Curiazio and throws herself upon it. Orazio tells her to dry her eyes and remember that she is a Roman. She replies that eternal weeping is all he has left her. Orazio begins to lose his temper and tells her that her actions are an insult to him. She turns on him sarcastically. ‘Easy to say .. we cannot have your moment of glory disturbed by impudent complaints’. He asks that if she will not honour him at least to honour Rome. With controlled rage Camilla replies, ‘to her – the arrogant cause of my misfortune, who through you sacrificed my true love’. She calls on the gods to rain down anger and fire on Orazio and Rome to light the pyre of Curiazio. The crowds draw back, horrified at her blasphemy. Blind with rage, Orazio draws his sword. The priests restrain him, ‘Heaven must punish her infamy, not you’. In her delirium, Camilla snatches the laurel wreath from Orazio’s head and tramples it underfoot. With a cry of rate he draws his sword. Camilla tries to escape from him, but catching her by her hair he plunges the sword into her heart.